ByDesign opening night reception at 7pm, hosted by ARCADE! 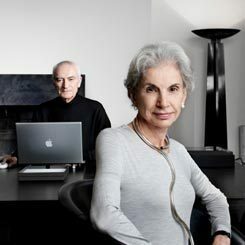 “If you can’t find it, design it” is the motto of the husband-and-wife designers Lella & Massimo Vignelli. Their New York City subway diagram and signage, American Airlines graphic identity, Heller dishes and countless other graphics, publications, corporate identities, products, packaging, architectural graphics and interior design, have, over the past 40 years, greatly influenced the American design landscape and endure beyond all fads. Design Is One brings us into the Vignellis’ world, capturing their warmth, intelligence and creativity. The film also includes interviews with architects Richard Meier and Peter Eisenman and graphic designers Milton Glaser, Michael Bierut and Jessica Helfand. This film is part of ByDesign 13, our annual series exploring intersections of design and film, co-presented with ARCADE and AIGA-Seattle. Read more about the week or get a series pass to see all of the ByDesign films at a discount, $40/Film Forum, ARCADE and AIGA Members, $60/General. As a Communication Design Strategist with the global design consultancy Teague, Cameron Campbell works closely with the brand and marketing teams of the firm’s biggest clients, developing strategies that drive category growth, increase brand awareness and engage consumers worldwide. Driven by defining the context of industrial and communication design within landscapes of living/urban public and private environments, Cameron brings a point of view to the ARCADE Board of Trustees that helps reach diverse audiences around the power of design of everyday.